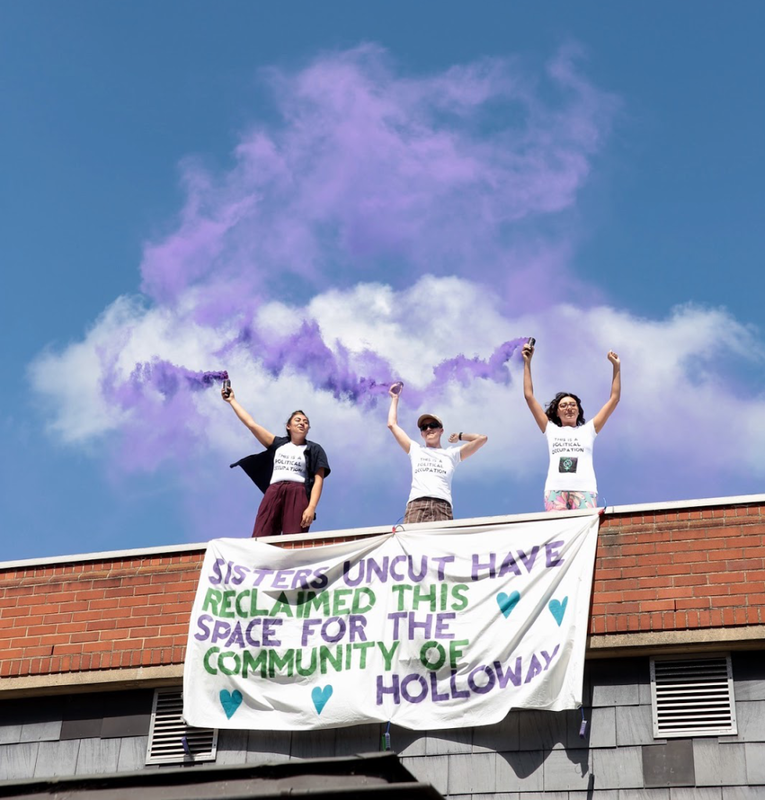 At 14:30 on Saturday 27th May, feminist direct action group Sisters Uncut occupied Holloway Prison Visitor’s Centre to demand that the empty space be used to support local domestic violence survivors. Eight activists entered the building via an open window, as 150 rallied outside. No arrests have been made. The action comes in advance of the general election. Sisters Uncut say that chaotic Conservative budgets have decimated the number of refuges in the UK and warn that the domestic violence sector is on its last legs. According to Women’s Aid, refuges are now being forced to turn away two thirds of women seeking safety. Sisters Uncut claim to be the ‘voice of domestic violence survivors’ in this election. They criticise Theresa May for failing to deliver her promise to make it easier for domestic violence survivors to vote in. This means that many survivors are locked out of voting for fear that their abuser will track them down via their address. Holloway Prison, the largest women’s prison in Western Europe, closed suddenly in 2016 and the buildings have been left empty since. Sisters Uncut plan to maintain their ‘reclamation’ for a week, holding workshops on women’s well being, self-defence and legal rights. Sisters Uncut are a direct action group protesting cuts to domestic violence services. The group was formed by domestic violence survivors and sector workers in 2014 to defend domestic violence services from austerity cuts, and has blossomed into a mass movement across the UK, with groups in Doncaster, London, Newcastle, Bristol, Portsmouth and Birmingham. Sisters Uncut are renowned for bold protest tactics, including jumping on the red carpet at the ‘Suffragette’ premiere, dying the Trafalgar Square fountains red and blocking bridges across the UK. In 2015, Women’s Aid reported that refuges are being forced to turn away 2 in 3 survivors who approach them to safety. Reasons for refusal range from lack of space to a refuge being unable to meet a survivors’ needs (such as language or disability). Women’s Aid data shows that for BME women, that number rises to 4 in 5 turned away. Women’s Aid campaigned for the government to make it safer for domestic violence survivors to vote, and the government agreed to make changes to the electoral system. However, these changes were not realised in time for the general election. According to charity Women in Prisons, 46% of women in prison report having suffered domestic violence.